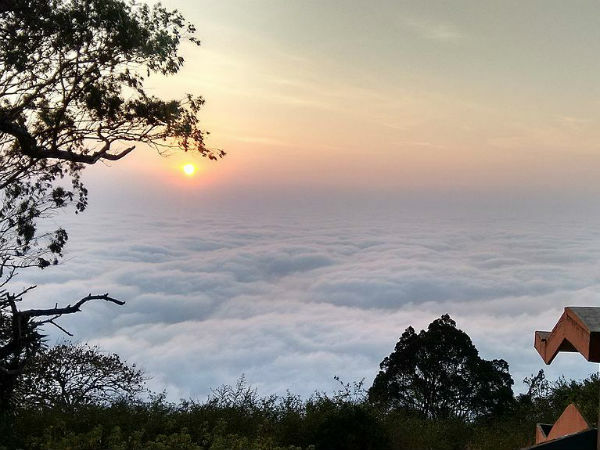 Nandi Hills, also known as Nandidurg or Nandi Betta is an ancient hill fortress which is located in the Chikkaballapur district of Karnataka. The hillock is located near the town of Nandi and is believed to be the place of origin of the Arkavathy river. Situated at a height of 4851 m above sea level, Nandi Hills is a favourite destination of nature lovers and is a very popular picnic spot. The hill is also home to some breathtaking scenery, rare varieties of flora and a very peaceful atmosphere, making it a perfect place for a holiday. By Air: The nearest airport is the Kempegowda International Airport which is located at a distance of 39 km from here. The airport is well connected to most of the major cities across the country and to a number of them abroad. By Train: The nearest railway station is the Chikkaballapur railway station which is around 10 km from here. The station receives various trains from different parts of the state and has frequent trains from Bengaluru. By Road: One of the best and most preferred modes to reach Nandi hills is by road. One can choose to drive up from Bengaluru city in their own modes of transportation or make use of the less frequent bus which begins from the Majestic Bus Station and takes you all the way up to the entrance of the hill. Bengaluru via Yelahanka, Chikkajala, Devanahalli, Nandi Cross, Karahalli Cross, Nandi Hills via Bellary road and NH 44 which would take you about an hour or so to reach the destination. There is another alternate route to reach Nandi Hills but is less taken as the road is almost isolated and does not have any sort of facilities in place. This is via the Budigere cross. The roads are well developed and well kept in the Devanahalli stretch as this road is also a connecting road to the International Airport. This same road connects you to Andhra Pradesh as well. Once you take the turn from the highway to the Nandi cross, the road takes you through the villages and one cannot miss the sight of vineyards on both sides of the road. Due to its close proximity to the city, most of the people set out on weekends during early morning hours to catch the sunrise, which indeed is truly breathtaking. Enroute to Nandi Hills, Devanahalli would be an ideal pitstop for those who wish to have a quick breakfast and sip on some hot tea or coffee. Devanahalli is the birth place of Tipu Sultan. One can find a fort on the highway which is said to be the birthplace of Tipu. The fort is a well-protected monument and one can choose to make it a point to visit the fort which was constructed in the 15th century. The fort had passed many hands before being surrendered to the British. After visiting the fort and having a quick breakfast, one can proceed to Nandi Hills, which is about 25 km from here and would take around half an hour to an hour to reach the hillock. Nandi Hills is well known for its scenic beauty and its peaceful surroundings. Apart from this the hillock has a host of historical monuments which generally most people avoid and rush to the view point to get a bird's eye view of the entire region and also to see clouds floating extremely close to you. The Tipu's Drop is one amongst the most visited sights here. It is the place from where prisoners were pushed off from the cliff as a punishment for the crimes committed by them. The place now offers you a brilliant view of the entire city. The next place is Nehru Nilaya. It is a beautiful 150 odd year old colonial bungalow and was the summer retreat of Sir Mark Cubbon, who was the commissioner of Mysore. At present the bungalow has been converted into a guest house which is managed by the Horticulture Department of Government of Karnataka. Amrita Sarovar is a beautiful water body which has been formed by the perennial springs and is also the prime source of water to the area. One can find a platform close by which is believed to be the spot where Tipu Sultan performed his prayers. Tipu Sultan's Fort is a major attraction atop the hill. The construction of the fort was started by Haider Ali, but was completed by Tipu Sultan. The fort has fine arches with minarets which are fine examples of the architecture of the bygone era. The beautifully designed towers and archways of the fort continue to awe visitors. The fort was the summer residence of Tipu Sultan.